Drift away into total relaxation as you float effortlessly atop 1500 pounds of Epsom Salt in our state of the art Float Lab tank. The float tank is a perfect tool to assist you in reaching deep states of relaxation. Physically, the Epsom Salt helps to pull tension out of tired, aching or over worked muscles. Mentally, the lack of stimulation and the warm gentle support of the water coaxes you into slowly unwinding, letting go and enjoying the time to simply be. Everything you need will be provided for you including a float specialist who will walk you through the entire process, answer any questions you may have and make sure you are comfortable and confident before your float. Afterward, we invite you to take your time integrating and reflecting on your float experience in front of our serene fish tank. You will be served water or tea and are welcome to browse our collection of books. Start you inner adventure today at Still Point Wellness and find your still point. Supported and held by a half TON of Epsom salts, you’ll effortlessly connect with your body’s natural deep relaxation response. Skin temperature water and fresh oxygen makes our state-of-the-art float chamber an ideal environment to safely explore the connection between your mind and body. People who float regularly report a deeper understanding and the ability to transform stressful patterns, habits and beliefs into new strategies for success and happiness. Current university research shows that floatation strengthens the immune system by countering the fight or flight reaction in the body, triggers the parasympathetic (relaxation) response. Floating is a personal experience and everyone has different sensations and experiences. If you are ready for an inner journey or simply need a little quiet time, Salt Water Floatation is for you. Salt Water Floatation is an ancient practice. From the sea side baths of the Romans to the travelers floating in the Dead Sea, the healing benefits of floating are well known. The "sensory deprivation" float tank takes this practice one step further. In the tank you feel weightless, the water is about the same temperature as your skin. The tank is dark and you wear earplugs so that the entire world is blocked out and your mind can rest. Originally created by John C. Lilly in 1954, the float tank was designed as an experiment to discover if consciousness remained after all outside distractions were removed. "It was argued that if all stimuli are cut off to the brain then the brain would go to sleep. Lilly decided to test this hypothesis and, with this in mind, created an environment which totally isolated an individual from external stimulation. From here, he studied the origin of consciousness and its relation to the brain." 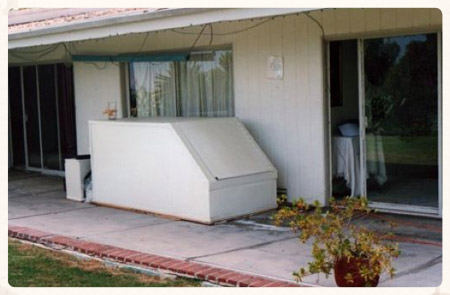 The floatation tank pictured below (right) was a gift from John C. Lilly to Timothy Leary. It was sent to ease Leary's end of life suffering. The tank sold on Ebay in May of 2012 for $6,700, with all proceeds benefitting MAPS research. We have come a long way from Leary's back yard tank. Our state of the art system has high ceilings and openness that allows you to fully relax with a state of the art filtration system and fresh air circulation. Do you know someone who could use a break from the everyday. Or, someone looking for an inner adventure? Floatation Packages make great gifts.